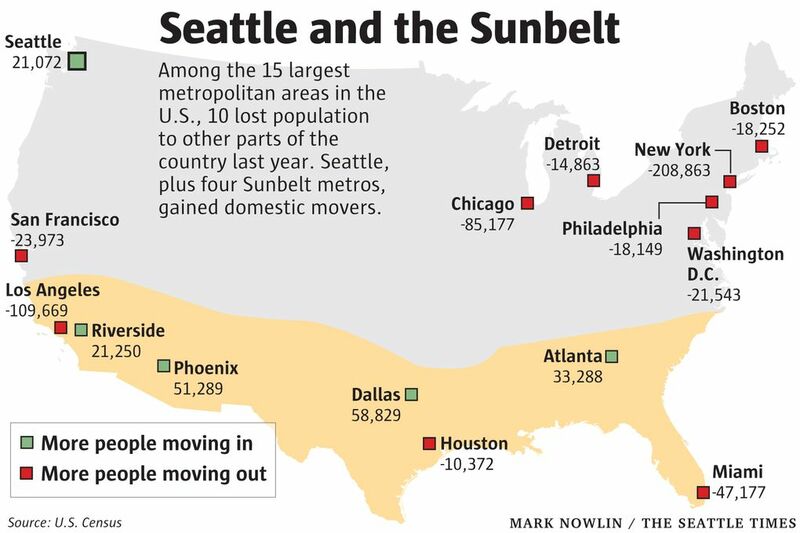 Seattle is the only metro area outside of the Sunbelt that had more people move in from other parts of the country than move away. San Francisco was among the metros that carried a net loss of 24,000 domestic movers. In terms of culture and climate, Seattle doesn’t have a whole lot in common with the southern U.S. But when it comes to attracting newcomers, we’d fit in very nicely down there. New census data show that among the country’s 15 largest metro areas, just five had an increase in “net domestic migration” — in other words, more people moved in from other parts of the country than moved away. Seattle is one of the five. From 2016 to 2017, we gained 21,000 more people from elsewhere in the U.S. than we lost. The other four? They’re all located in the sunny, lower third of the nation: Dallas, Atlanta, Phoenix, and Riverside, Cal. People have been flocking to the Sunbelt for years, drawn by affordable living, warm weather and jobs. As for Seattle … well, our cost of living is through the roof, and it rains all the time — but we sure have a lot of jobs. Over the past decade, Seattle has added 220,000 of them, fueling our remarkable population growth. While 10 of the 15 largest metros saw losses from domestic movers, almost all of them still grew through international migration and births. Only Chicago experienced an overall decline in population. It shrank by 13,000 last year. The new data show that in the metro areas we tend to think of as Seattle’s peers, more folks are leaving than arriving. Washington, D.C. had a net loss of about 21,500 domestic movers last year. In Boston, 18,000. San Francisco ran a deficit of 24,000 movers. When you consider what it costs to rent, let alone buy, in any of these places, it’s no mystery that a lot of people are leaving. Aging baby boomers are another factor. As more of them enter their Golden Years, they are leaving the major job centers where they’d settled and moving to smaller, retiree-friendly communities. While Seattle is subject to these same demographic forces, we’re still drawing in enough newcomers from around the nation to easily offset any losses. The three largest metro areas in the U.S. all lost residents to other parts of the country, but in even more dramatic numbers. Collectively, New York, Los Angeles and Chicago had a net loss of about 400,000 people through domestic out-migration. Besides L.A., two other major metros in the Sunbelt saw more people moving away than moving in from other parts of the U.S.: Miami and Houston. Seattle also gained about 21,000 residents through international migration, almost the exact amount we grew through domestic migration. And “natural increase” (the number of births minus the number of deaths) contributed another 22,000 to the population here. It adds up to a total population gain of 64,000, the 6th-biggest increase of any U.S. metro last year. Dallas had the largest numeric growth, by far, at 146,000. 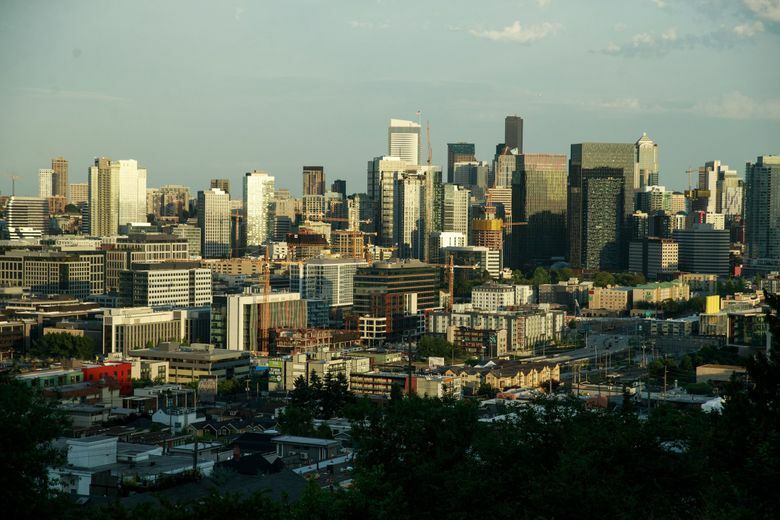 The Seattle metro area’s population now stands at 3.87 million, and ranks as the 15th-largest in the nation. The Census Bureau also released population figures for counties. Looking at the ones that comprise our metro area — King, Snohomish, Pierce — you can see that the high cost of living here is having an impact on how growth is distributed. Even though King County is still growing — the population increased by 1.5 percent in 2017 — it was the slowest it’s been in five years. King added about 33,000 people last year, down by 3,000 from 2016. Here’s another way to look at the slowdown. If you go back to 2013, King County ranked No. 1 among Washington’s 39 counties for rate of growth. Last year, we ranked 24th. Both Pierce and Snohomish counties grew at a faster clip than King in 2017. And in this way, we’re very similar to other high-priced large metro areas, where central counties are losing population to less-expensive, farther-flung suburbs. Washington’s fastest-growing county last year, though, was not in the Seattle area: Kittitas, where Ellensburg is located, saw its population increase by 2.8 percent. Only one county in the state shrank: Garfield, in southeastern Washington. It lost 2.1 percent of its residents, further cementing its status as the state’s most sparsely populated county. It now has a total of just 2,210 inhabitants.